While most attention has understandably been focussed on Wembley these past few days there was the not so small matter of the latest leg of the Grosvenor UK Poker Tour (GUKPT) to consider over the weekend. The latest stop of the Tour was in Portsmouth with a total of 134 players hitting the tables in the £500+£50 Main Event. After three days of action the Tour crowned a new winner with Nick Humphris taking the title and with it a first prize of £16,500. Yesterday's final table action started with a flurry of elminations with Morgan Sorfleet the first to go when his top pair and a gutshot failed to outrun Khalick Mohangee's top pair, top kicker. Mohangee was at it again minutes later, sending Dennis O'Mahoney to the rail after turning a straight to with pocket 7s to beat O'Mahoney's pocket queens. Dom Mahoney was responsible for the next few eliminations, first beating Trevor Bowers' pocket 2s with aces then crushing Adam Boutwell's K-10 with A-K. Blair Hampton followed in fifth, getting it in with AK on a king high flop but running into Mahoney's pocket kings. Mohangee's luck run out in fourth on an A-9-A board when his 7-9 was dominated by Mahoney's J-9. 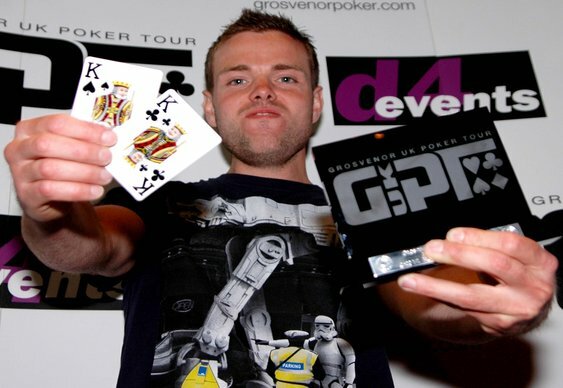 Simon Skinner was out of luck in third too when Mahoney flopped a deuce with A2 to beat his A4. That elimination set up a heads up clash between Mahoney and Humphris and it proved to be a topsy turvy affair with plenty of swings. After agreed a deal, all the chips hit the middle with Humphris' pocket kings holding against Mahoney's pocket 7s. The GUKPT heads to Reading later this month. Qualifiers for the Main Event are up and running at Grosvenor Poker.